Copyright © The White Mole (Sheharazad P. Fleming) on Flickr. All Rights Reserved. Copyright © Curt Bianchi on Flickr. All rights reserved. 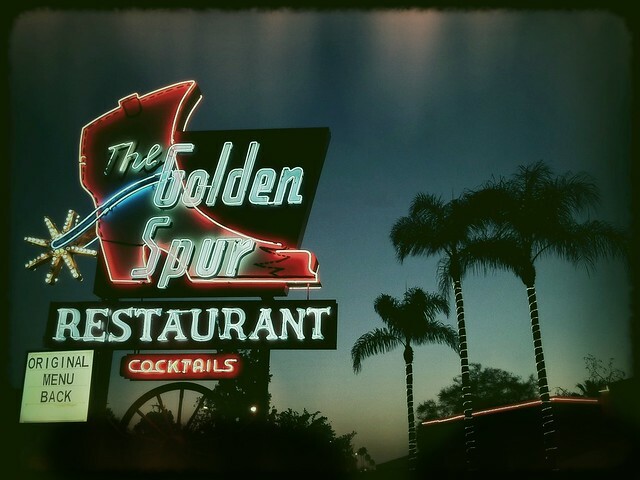 Founded in 1918 — eight years before the road it sits upon was given its famous number — The Golden Spur Restaurant is the best such place remaining on what I consider to be "my" stretch of Route 66 which is anywhere from the Cajon Pass out to Monrovia. That piece of The Mother Road is a bit embarrassing as far as I’m concerned because so little of those glory days has been saved. With the exception of the magnificently restored Wigwam Motel No. 7 on the border of San Bernardino and Rialto and the three classic restaurants at the border of Upland and Rancho Cucamonga, most everything else of note along the way is bland or too frightening to even think about slowing down to look at much less stop. 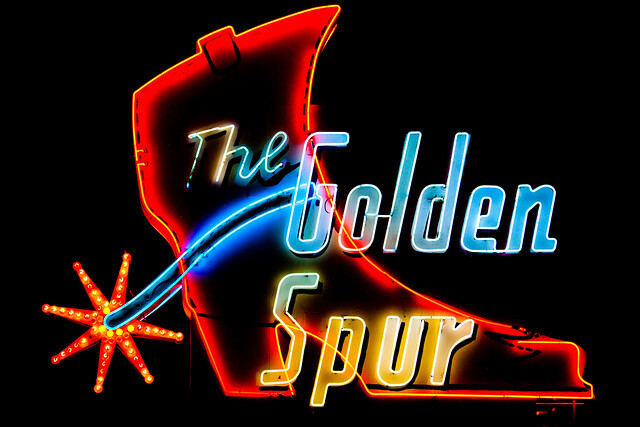 The Golden Spur Restaurant is not the typical burger joint or café that one often thinks about when dreaming about Route 66. While the fare and service are more in line with a fine dining establishment, it accepts the casually dressed. As for the prices, for the type of food served, I believe they are quite reasonable for this area of California. It is very rare that I give out endorsements. However, in this case…well, just look over the menu on The Golden Spur Restaurant’s website linked under each of the three photographs [links now removed; see below]. If any of that sounds good, try to stop by when doing the Route 66 thing or just hanging out in the general area. It’s still locally-owned, the service is kind, and the food is delivered fresh every day. I think anybody that takes my advice will see why this place has survived for so many decades. 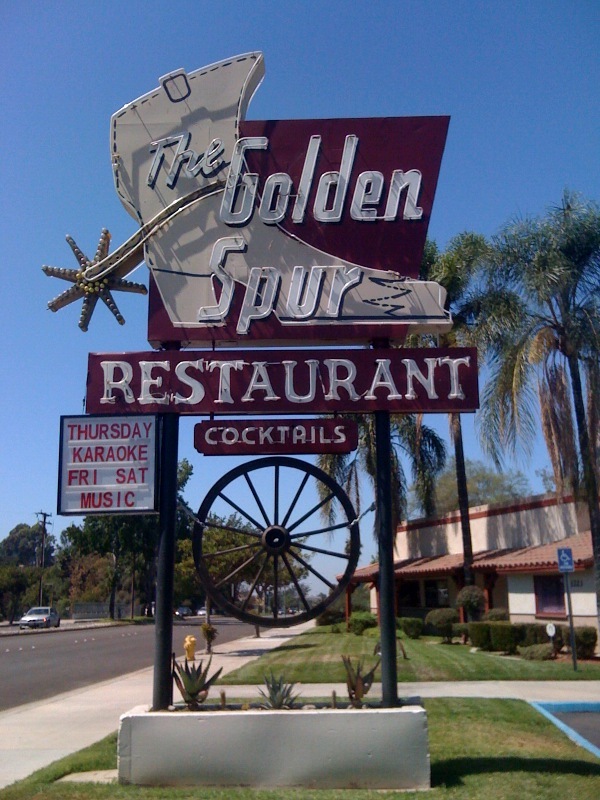 ADDENDUM 2018.10.26: I saw the sad news today that The Golden Spur closed with only one day’s notice back on October 12, 2018. The current rumor is that the land is to be sold for condominium development and the sign will be taken to L.A.’s neon museum. I have a feeling none of that will happen without a fight in a city that prides itself on still having some spirit of the Mother Road. Posted in Food, Retro/Vintage, sign, TravelTagged Americana, neon, nostalgia, restaurant, Route 66, SoCalBookmark the permalink.